I have been enjoying the cutout trend and so when I saw Burda 08-2014-116 I instantly fell in love and had to make it. I just happened to have a trip to New York planned, so finding the perfect fabric for it was on my list. This lightweight rayon was exactly what I was looking for--I love all the colors in the print, I like that it's a dot and not a floral (I love floral, but have a LOT of it), and it has the perfect floaty factor. For the back bodice, I did a Broad Back Adjustment and also took a HUGE tuck out of the back neckline, which was really, really wide. The bust dart on the front bodice is actually pretty small as drafted so I did not do any alteration for SBA. I think if you are larger than an A cup, you'll want to do a FBA even if you don't normally need to. The front neckline is a wee bit wide; I wish I had taken a little bit of width out of it at the pattern alteration stage. The pattern is drafted as a boatneck, which is difficult for me to wear given that I am short. I lowered the front neckline 2 1/2 inches (!) from where it was drafted, and it is still reasonably high. So keep that in mind if you are at all chokey from high necks as I am. For once, I didn't need to do a swayback adjustment to the pattern because the cutout is basically at the swayback. 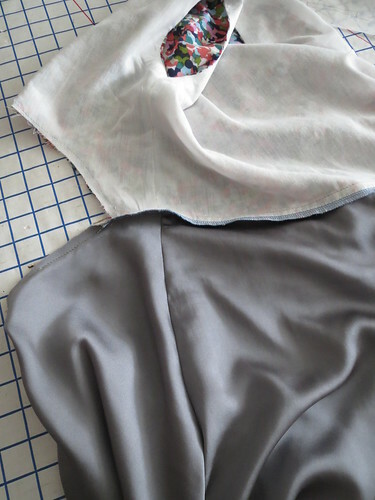 The skirt was too long as drafted, so I folded out 1 1/2 inches on each piece before cutting. 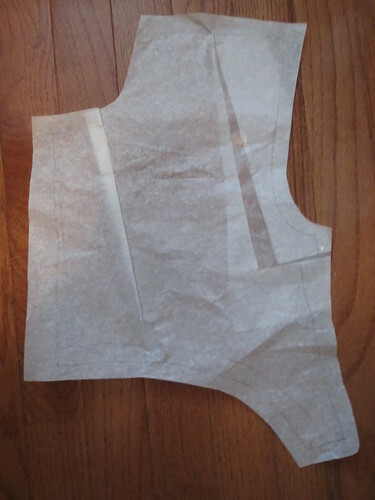 The pattern as drafted is lined in the bodice, but not in the skirt. This fabric was too sheer not to line the skirt. I'm *not* into the trend of having a short lining under a long sheer skirt (the 20somethings in DC are ALL OVER this look--like 50% of them on a Saturday night will be wearing this), so I thought a contrast lining was the way to go. I immediately thought of the gorgeous green silk/cotton I got during Martha Pullen's epic silk/cotton sale, but didn't want to waste the vast expanse of it needed to fully line the skirt. After agonizing over it way too much, I finally realized that duh, I could use cheap ordinary lining for most of the skirt and then add the silk/cotton at the bottom where it would show. I lined up the center front and back skirt patterns and marked where the center front hit the center back. I later realized that the back skirt dips down below the front skirt at the waist, but luckily I gave myself a good 2 1/2 inch cushion and only the decorative lining shows. I then drew in the line for the decorative lining, making it about 2 1/2" wide in the front. It all worked according to plan. I got my pretty contrast lining without "wasting" an acreage of lovely fabric. Because there is no front or back center seam I couldn't do my usual all-machine clean finish. I would normally use this method in that instance, but I was intrigued in reading Burda's instructions for finishing; yes, the Wooden Spoon Method. I have seen the Wooden Spoon illustration many times. I imagine that every month someone walks into Dagmar Bily's office and is like, "Disaster! There is too much white space on the instruction sheet!" and she pulls her best Miranda Priestly and is like, "Have you used the Wooden Spoon yet? Seriously, do I have to think of everything myself?" and they're like, "Of course! The Wooden Spoon! The Wooden Spoon will save us!" Seriously, I think it's in every issue. But the illustration has always made zero sense to me. Until now. As with my normal clean finish technique, I started by trimming 1/8" inch off the neckline and armscye edges of the lining. 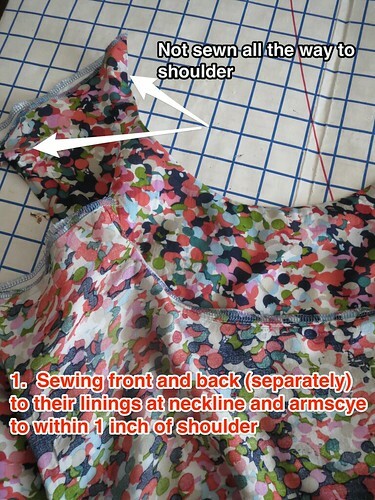 Sew the bodice pieces together with their respective linings along the neckline and armscyes to within about an inch of the shoulder. Finish/trim the seam allowances (I do it in one with the serger). Finish the unsewn shoulder edges by serging, zigzagging, or your choice. Slide the front bodice inside the back bodice/lining, with the fashion fabric right sides together and the lining right sides together. Match up the shoulders of the fashion and lining fabrics, and then pin. 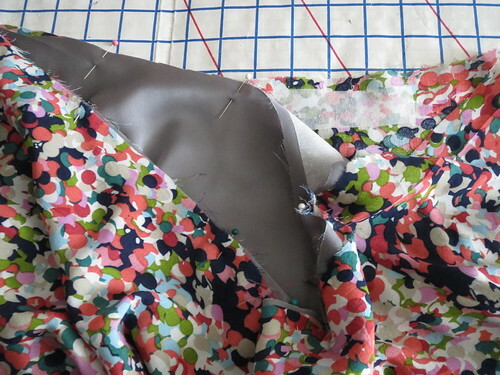 You now have four shoulder seams to sew: fashion fabric right, lining right, fashion fabric left, and lining left. Now for the famous Wooden Spoon: Pull the front, which is inside the back, further through the back more toward the outside so the shoulder seams are no longer at the edge. Slide the wooden spoon into the holes where you did not sew all the way up to the shoulder at the armscye and neckline. 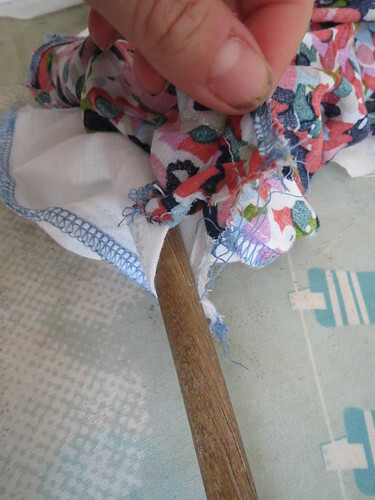 Position the shoulder seam over the wooden spoon, and use it as a "ham" to press open the seam. Frankly, I was pretty disappointed in the wooden spoon, which did not really make it easy to press open the seam. I should have grabbed my wooden spoon that has a flat handle, but now that I live in a two story house such frivolous trips back and forth to the kitchen are more carefully considered. 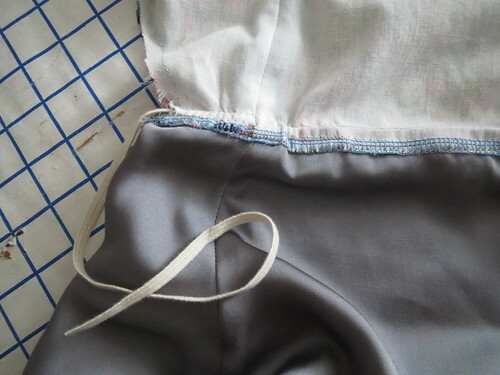 Once your shoulder seams are pressed, keep the front pulled through, match up shoulder seams of the fashion fabric and lining (which are right sides together), and pin the little hole you left through which the wooden spoon was threaded. Again, you have four shoulder edges to do. Sew. Pull the front out the bottom to turn right side out. I have to say, I am impressed with this method. 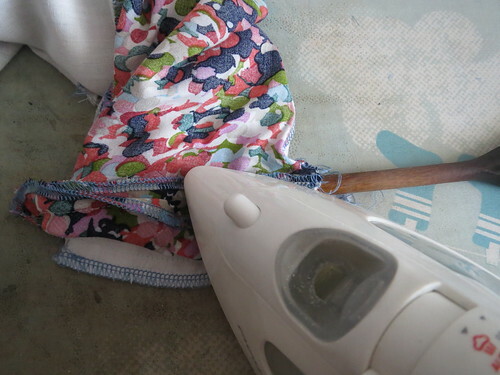 My alternate method requires a few inches of hand sewing, but this method is all machine. Well done, Burda and your Wooden Spoon. 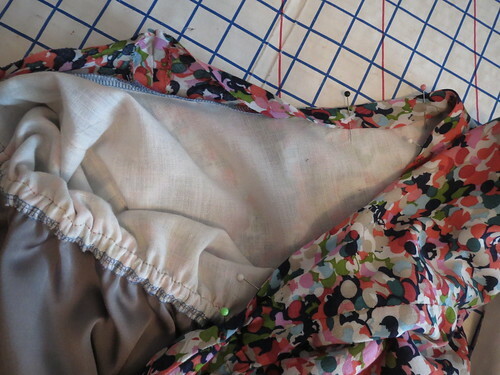 I sewed the side seams of the fashion fabric and lining of the skirt separately so they would hang free, and then basted them together at the waistline to be treated as one. I interfaced both pieces where the buttonholes for the drawstring would go, and then did the buttonholes through both layers as one. The dress is pretty straightforward to put together. Once the bodice is completely lined, the bodice and lining are treated as one at the waist. I basted the two layers together to avoid shifting. 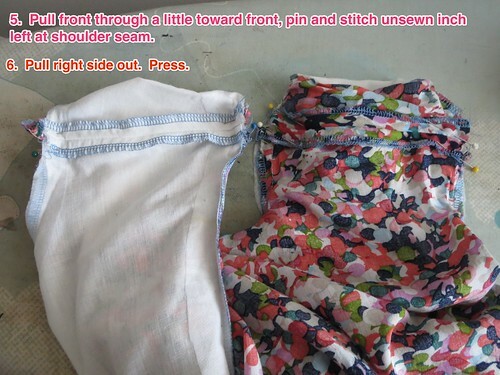 Sew the bodice to the skirt up to where the back skirt dips into its hole. 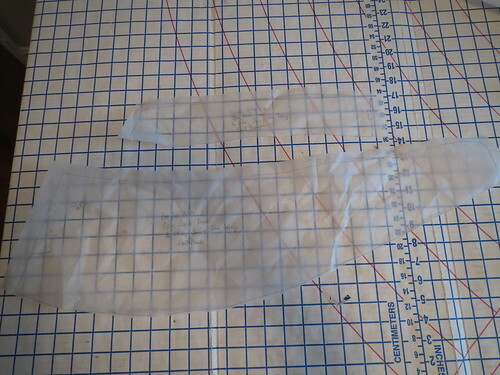 Use the seam allowance to make a casing and thread elastic in. 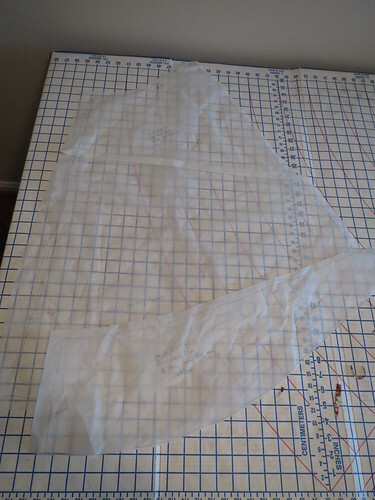 Burda has a misprint in the instructions, which tell you to "sew the ends together." Unless you have a 17" waist and are looking for a figure 8 in the back, you want to sew the ends into each end of the casing. 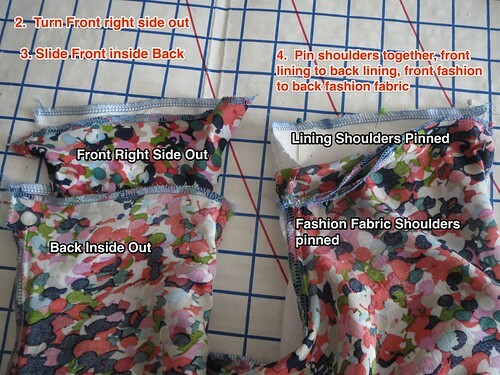 The join of the skirt/bodice/casing is a little ugly, but it gets covered up by your finishing--I used bias tape as described below. Burda has you make a facing for the back cutout. I really don't know why you'd use a big unwieldy fabric-hoggy facing instead of bias tape. I used self bias tape, stitching it right sides together all the way around the hole then turning it to the inside to form a casing. Make your ties and join them with elastic in the middle, then thread through the casing. Love this dress! It was also pretty simple--it might be a fun 3rd or 4th project for a dedicated beginner. I may someday straighten out the hem, but the high-low thing is still going on and my other iteration, last year's birthday dress, was totally disappointing due to the poorly drafted pattern. The cutout is just perfect, and I like the cut of the bodice with the wider shoulders. I'm considering drafting the cutout right out of it for a simple summer dress pattern--I feel like I'm seeing a lot of the simple dress with elastic waist (like this and this) this year and this one has well-balanced building blocks. All photos are here and the pattern review is here. I'm still working on a photo location. Standing at the top of the stairs has more even lighting from the skylight--directly overhead instead of over one shoulder--than standing along the side wall, but then you get the gaping maw of the downstairs look, which is a little weird. Also, I'm afraid of accidentally getting too close to the stairs and falling backward down them.